Below are pictures from the 2018 Presentation Evening held at Chester Road. The banner the league has purchased from Shropshire Printers. 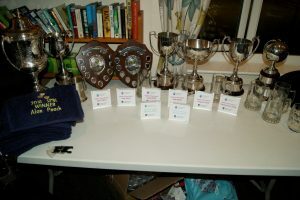 The collection of trophies to be presented. 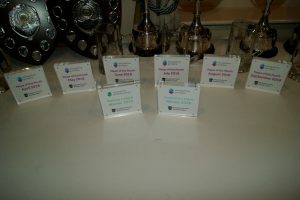 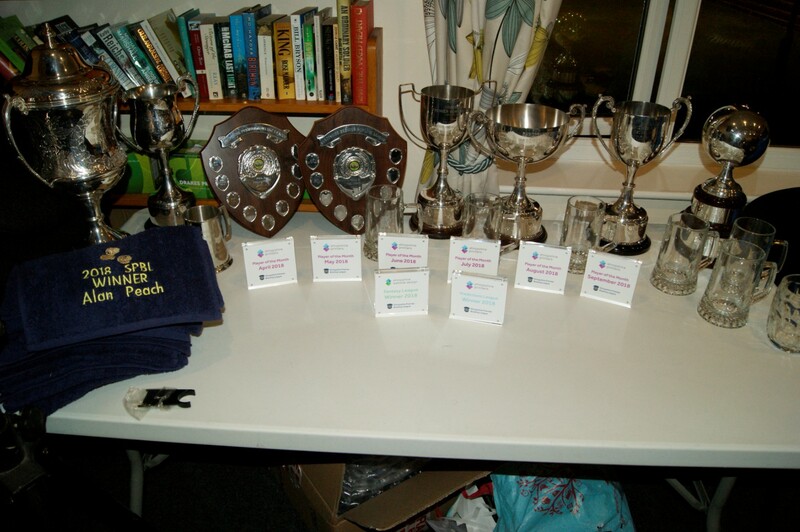 The acrylic trophies provided by Shropshire Printers and Shropshire Website Design. 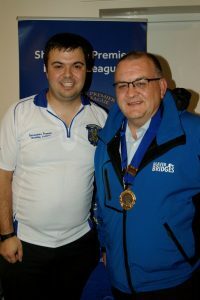 Treasurer Rob Burroughs presents Chairman Mark Shore with his chain of honour. 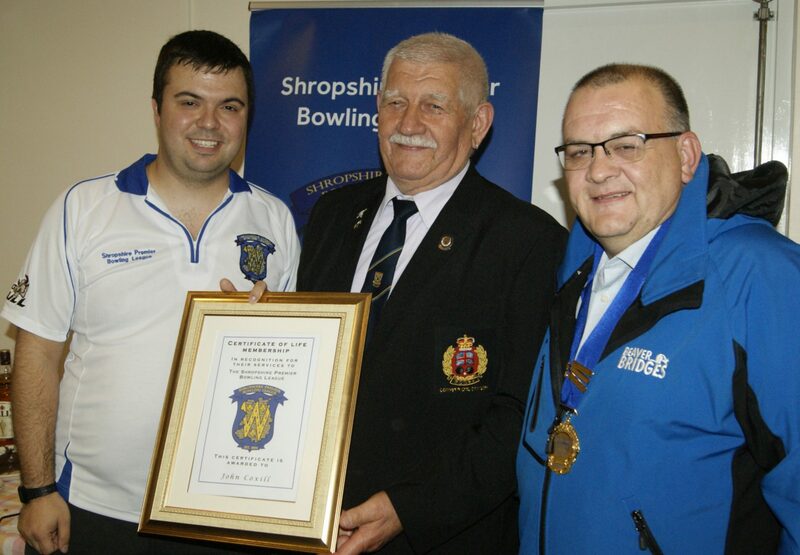 John Coxill receives his Life Membership award from Treasurer Rob Burroughs and Chairman Mark Shore. 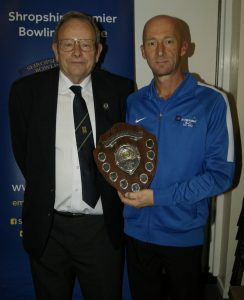 Trophy Donor John Coxill presents the Seaton Sports League Merit Trophy to Stuart Rutter. 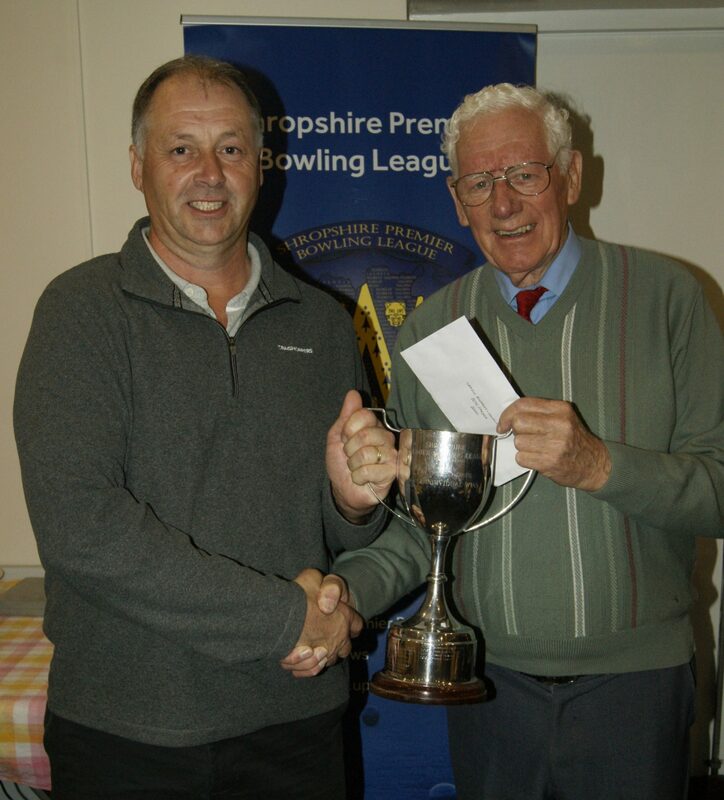 Stuart Rutter receives the KGJ Insurance Mike Hinton Pairs trophy from League Chairman Mark Shore. 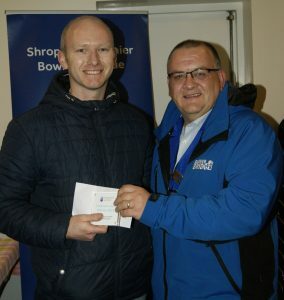 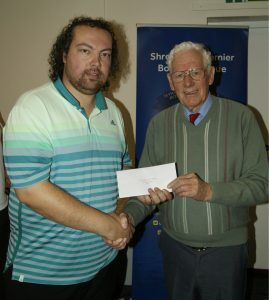 Callum Wraight receives his cheque for second place in the League Averages from former League President Neville Edwards. 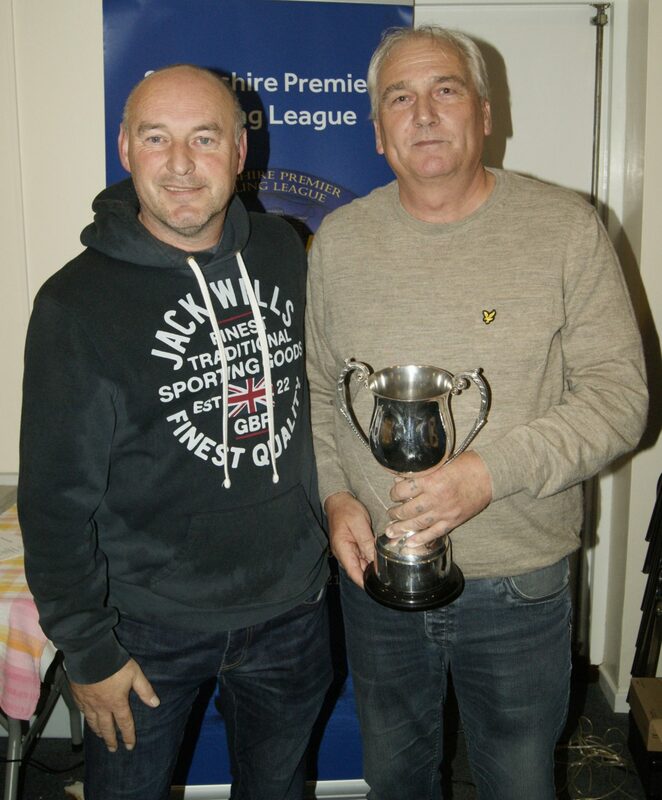 Peter Farmer receives the League Averages trophy from the trophy donor Neville Edwards. 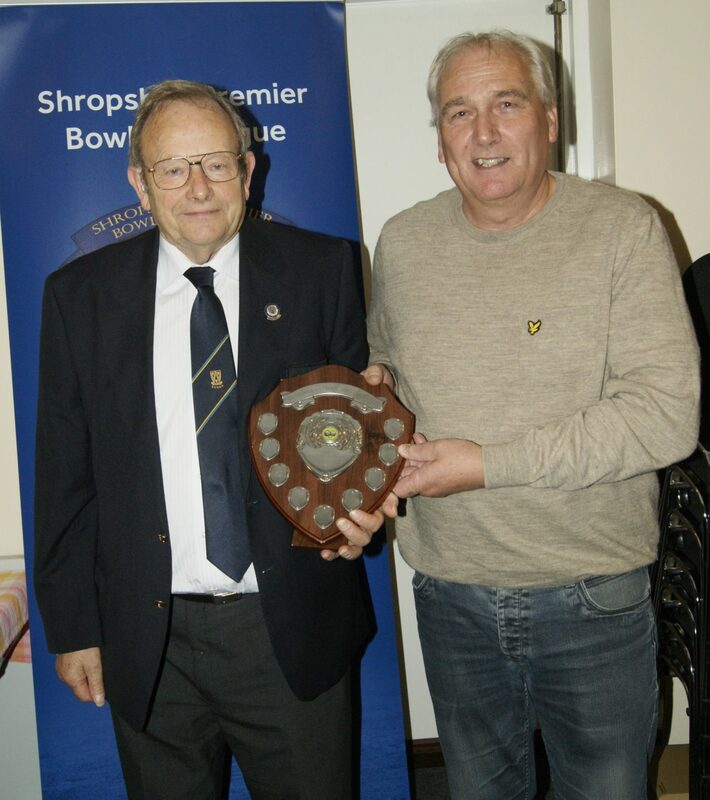 Dave Ellison, representing sponsors Barlows Fire & Security, presents the Alan Mayhew Trophy to Castlefields vice-captain Graham Rogers. 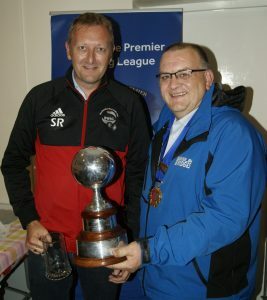 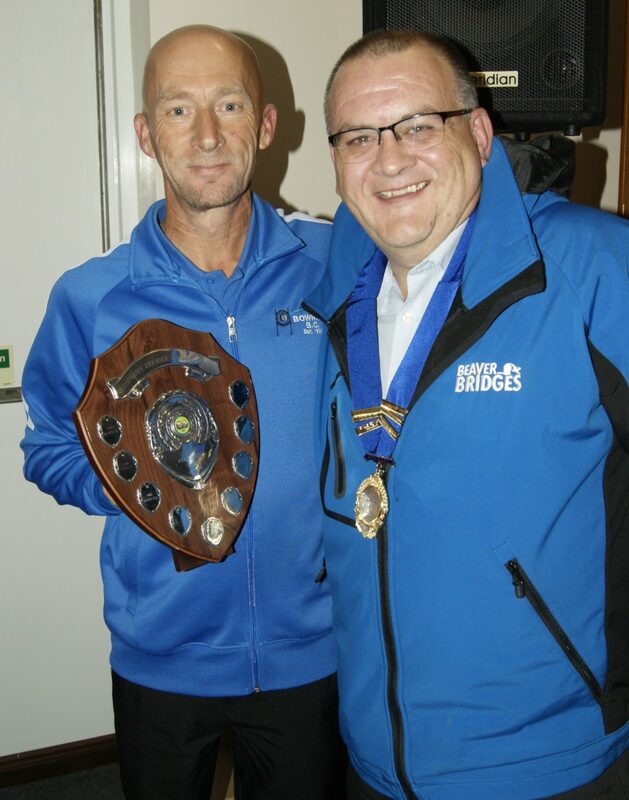 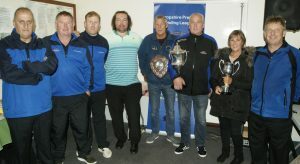 County Deputy President Mike Beckett presents the Seaton Sports Pool A trophy to Castlefields vice-captain Graham Rogers. 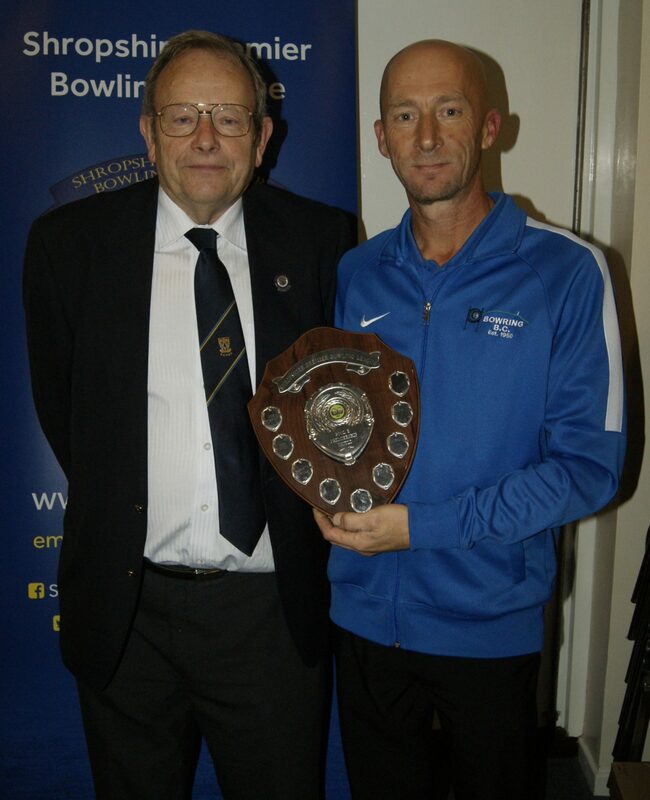 Rich Lawson receivers the Seaton Sports Pool B trophy from County Deputy President Mike Beckett. Baschurch team mates Mark Shore and Rich Lawson with the Pool B trophy. 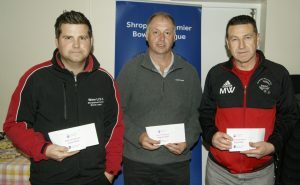 Three of the Shropshire Printers Player of the Month winners show off their acrylic trophies and prize money. From left, Chris Brettell, Pete Farmer, Martin Wiliams. 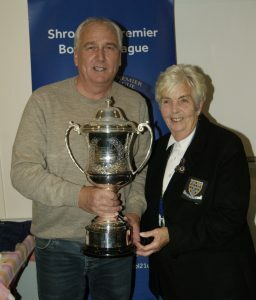 Chairman Mark Shore presents the Shropshire Website Design Fantasy League winner Cheryl Caswell her acrylic trophy, the first ever female winner in the league. 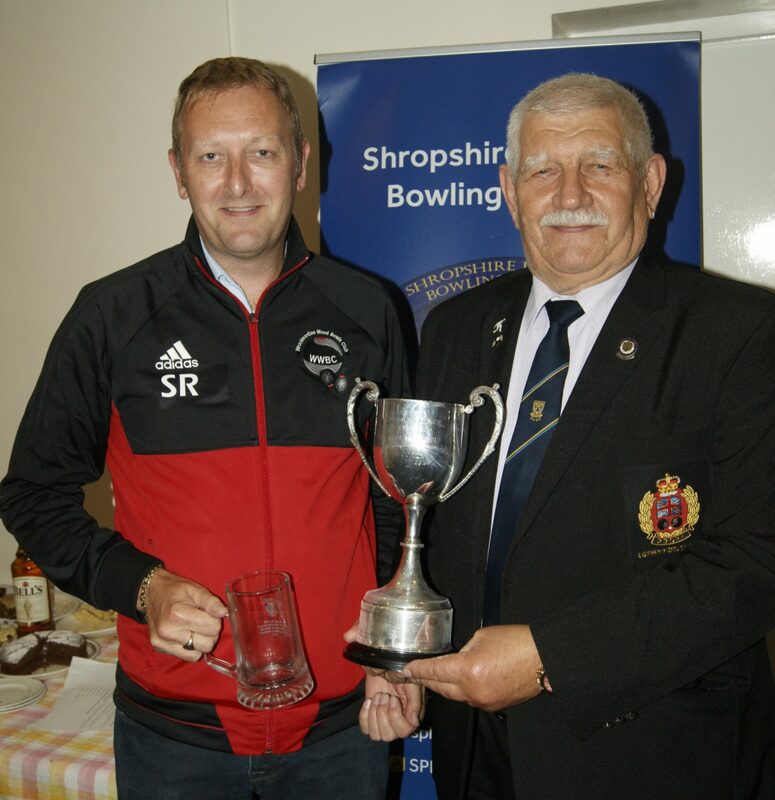 Chairman Mark Shore presents the acrylic trophy and prize money to Paul Gleave, who won the Shropshire Printers Predictions League. 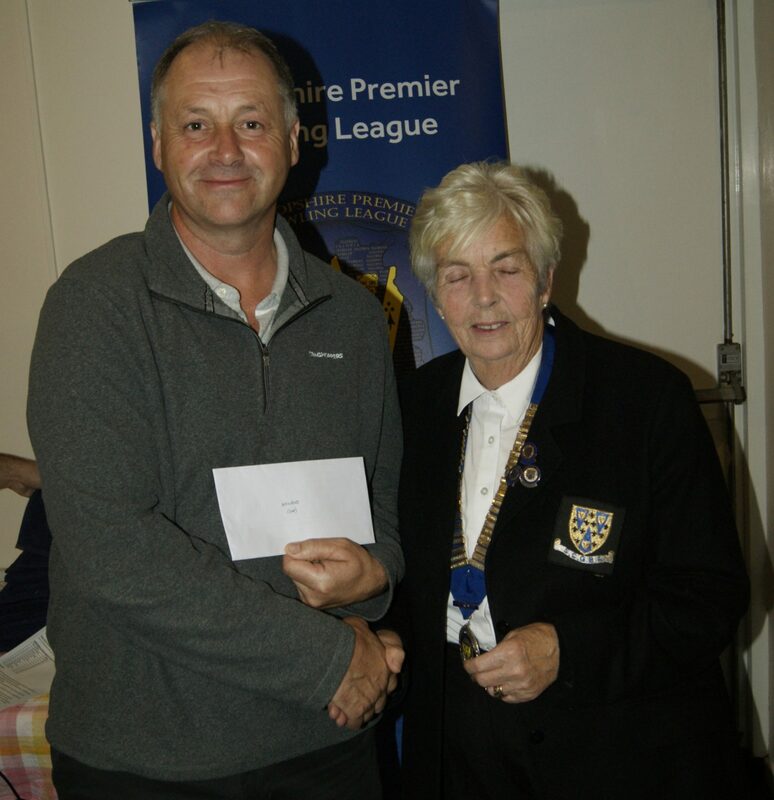 County President Isobel Jones presents prize money to 3rd placed Sir John Bayley, represented by Rob Burroughs. 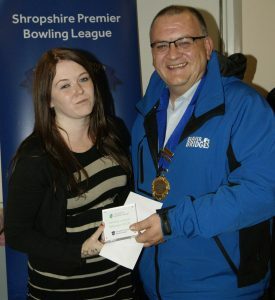 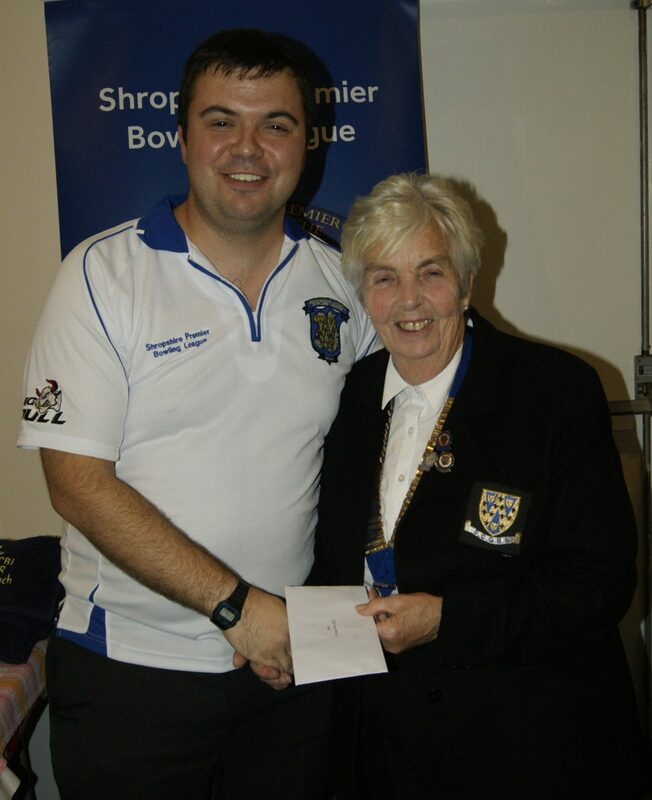 Pete Farmer receives the prize money for 2nd placed Newport from County President Isobel Jones. County President Isobel Jones presents the League Trophy to Castlefields vice-captain Graham Rogers. 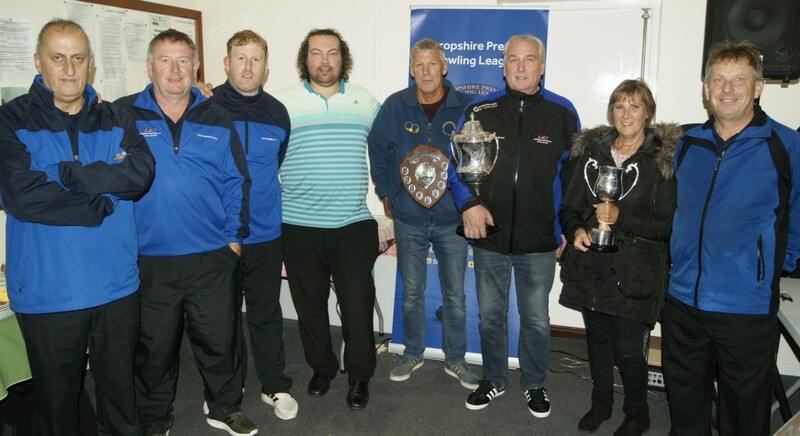 Some of Castlefields’ players, supporters and officials celebrate their treble success from this season. 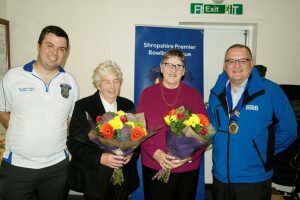 Rob Burroughs and Mark Shore present flowers to Isobel Jones and Merle Coxill for their long time support of the league.